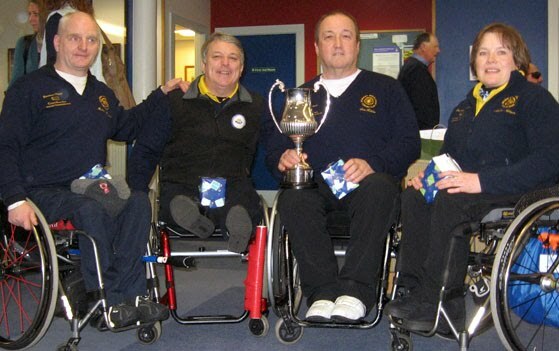 Aileen Neilson completed a very successful season with a win over her national teammate Gregor Ewan in Sunday's final of the Scottish Wheelchair Curling Championship in Aberdeen. It was sweet revenge for Neilson, who lost 6-5 to Ewan in the British Open final last November. The current Scottish national side was divided between the two finalists, with Aileen joined by Tom Killin, plus Michael McCreadie and Ian Donaldson. Gregor Ewan played with national teammate Mike McKenzie, plus Jackie Cayton and Jim Gault. It was a cagey game, with three blanks before Ewan put the first point on the board just before the break. Whatever was in Team Neilson's water bottles, it worked as they returned to score 4 in the 5th then stole 3 more in the 6th on their way to a 7-3 win. You can find semi-final and final line scores HERE.